seated massage can improve players’ swing on golf days. 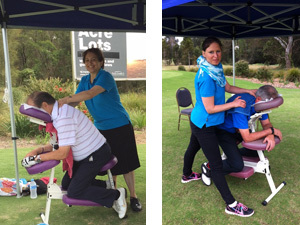 Absolutely Corporate specialises in providing on-site seated massage for Corporate Golf days. Seated massage has proven very popular with staff members and corporate clients. Add an element of relaxation and fun to your next Corporate Golf Day. Massage is a well deserved treat when playing a 3-hour round of 9 holes or a 4.5 hour game of 18. Many participants have claimed our massages improved their swing, while others were tempted to forfeit the rest of their game to stay in our massage chair! 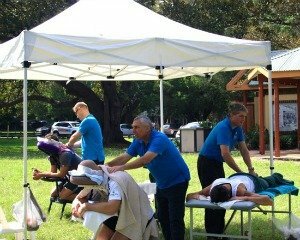 Absolutely Corporate is a nationwide provider of seated massage therapy at workplace, corporate golf days, conferences, trade shows and product launches. our qualified massage therapists set up at your chosen time – before or after the game – and give each participant an invigorating massage to loosen up their muscles and improve their swing! Location. Our therapists arrive at any golf course and setup at the allocated tee before the start of your event, so there are no interruptions during the game. Alternatively we can provide seated massages at the Club House before or after your event. All we need is a quiet place where players can relax and benefit from the treatment. Communication. We always check with each player on how strong they like their massage pressure. Our therapists can adjust the pressure to strong, medium or gentle. It’s your massage so we want you to get the most out of it. Health concerns. Let the massage therapist know if you have any health concerns, e.g. a shoulder injury, or would like to focus on a specific area of your body. 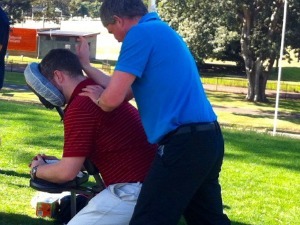 During golf day massage our therapists focus on upper back, shoulders and neck. They are professionals dedicated to tailoring a session that will help relieve your discomfort. Relax! We encourage minimal talking during the massage so other players can concentrate on their game. The short massage is a wonderful opportunity to close your eyes, relax, and observe how your body feels in the present moment. Stay hydrated. After the massage, make sure you keep hydrated. We usually have an esky with cold drinks next to our marquee for your convenience.